The Brattleboro Citizen Police Communications Committee (CPCC) will meet on Monday, April 22, 2019, at 5:30pm in the Brooks Memorial Library Meeting Room. The newly-formed Starr-led Selectboard will have their first regular meeting Tuesday evening. They’ll hold it right after their first Executive Session, which comes right after their first committee candidate interviews. It won’t all be start-up stuff, though they will review Rules of Conduct and choose committees to attend. Red Clover Commons 2 will be applying for a grant, Representative Town Meeting items will be reviewed, historical markers, loans and knotweed will be discussed, and a new conflict of interest policy will be considered for adoption. You can, as always, bring up other items during public participation. 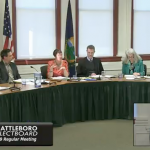 The Brattleboro Energy Committee will meet on Monday, April 1, 2019, at 5:00pm in the Hanna Cosman Meeting Room at the Municipal Center. The Brattleboro Tree Advisory Committee will meet on Thursday, April 4, 2019, at 6:30pm in the Community Meeting Room at the Brattleboro Food Co-Op, located at 2 Main Street. As part of National Vietnam War Veterans Day. 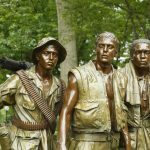 Brattleboro VA Community Outreach Clinic will honor Vietnam War Veterans with refreshments on March 29 from 11 a.m. to 1 p.m.
All Vietnam War veterans are warmly invited to attend. 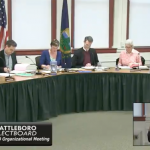 The Brattleboro Selectboard will hold a special organizational meeting on Monday, March 25, 2019, at 5:30pm in the Selectboard Meeting Room at the Municipal Center. The Brattleboro Citizen Police Communications Committee (CPCC) will meet on Monday, March 25, 2019, at 5:30pm in the Brooks Memorial Library Meeting Room. Time once again for the little list of little (and big) things anyone notices around Brattleboro. BusyMom beat me to one of them – Burger King at Exit 1 appears closed. 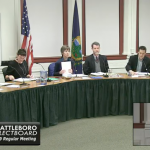 The Brattleboro Arts Committee will meet on Wednesday, March 20, 2019, at 1:00pm in the Hanna Cosman Meeting Room at the Municipal Center. The Brattleboro Traffic Safety Committee will meet on Thursday, March 21, 2019, at 8:00am in the Selectboard Meeting Room at the Municipal Center. 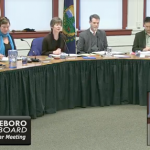 The Brattleboro Trustees of Public Funds will meet on Friday, March 22, 2l019, at 5:00pm in the Hanna Cosman Meeting Room at the Municipal Center. The Brattleboro Selectboard will wrap up its year with lease agreements and tire removal. They will also hear from the Brattleboro Country Club regarding a recent liquor violation before giving them a new liquor license. The Energy Committee might be reduced in size, Experienced Goods will extend their lease at the parking garage, motions will be assigned, and you might be appointed to a committee. You can always bring up other matters during public participation. Please see attached and the below link for the “unofficial results” for Brattleboro Town Meeting. The attached is formatted to show the unofficial winners for each race in bold. These are the results from the ballot tallies, not including write-in votes. https://www.brattleboro.org/(click on “Unofficial Results 3-5-2019 Election” on the right hand side). 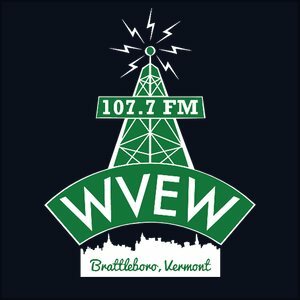 On Tuesday, March 5th’s Brattleboro town ballot (on the back side) is a ballot measure – “Article II” – that will grant 16- and 17-year-olds the right to vote on town issues and candidates, be elected to and serve on local school boards (up to 2 on each), and be elected as Town Representatives. The measure has received the endorsement of Brattleboro resident and Senator Becca Balint, and Lieutenant Governor David Zuckerman.